My work is about capturing the essence of summer. The way I’ve chosen to do this is from a height, unobtrusively by using helicopters and long lenses. Putting these two together means I can discreetly fly over wonderfully busy and colourful beaches, such as Amadores in Gran Canaria, and photograph the wonderful sights of the beach below me. I have been fortunate to shoot all over the world, from Bondi beach in Australia to Mexico and, of course, the Canary Islands. I search out colour, texture and interesting landscapes; this gives me a great foundation to build from and document what I can find on that particular day. I shot Amadores beach in 2015, but I’ve been shooting aerials since 2011. I’d always wanted to photograph both black sand and white sand beaches. In Europe my options were fairly limited, but Gran Canaria was perfect and gave me a fantastic opportunity to contrast the crisp white sand beaches against the dark volcanic tones of the black sand beaches. There’s always a starting point for a project – a moment of inspiration. 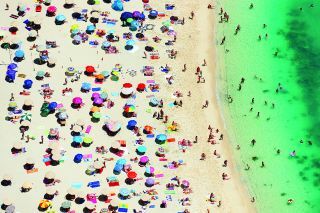 For my shoot over Gran Canaria I knew I’d be getting very colourful and busy beaches that would also be quite white. This would make a great canvas for the beautifully colourful beachgoers to pop off from. The Canaries are famous for their high winds, so as you can imagine hanging out of a helicopter over busy beaches whilst being thrown around by the wind is quite challenging! A high shutter speed is also required to overcome the vibrations from the helicopter, but as I’m shooting downwards the relatively ‘flat’ plane means that depth of field isn’t too much of an issue; so I can use wide apertures and a low ISO for the best possible quality in photographs. I’ve shot every series of mine on Nikon cameras, from a D300 to a D3S and now I’m using – and loving – the D800E. Lens-wise the Nikon 70-200mm f/2.8 VR seems to be my go-to for aerial photography, giving me the telephoto reach I need. I’ve been using Nikon kit for nearly 20 years now, so I am very familiar with how the cameras and lenses are set up. After all, when you’re dangling out of a helicopter at 2000 feet it’s useful to know how to change any setting as quickly as possible. By sticking with Nikon I’ve been able to work faster and get some shots I wouldn’t have otherwise been able to get. In my experience, creating a series is not just the taking of the photos; it goes all the way through to the exhibiting of it. So seeing how beautifully LUMAS have framed images like Amadores Beach is an utter delight. The most enjoyable moment is walking in to the LUMAS gallery on South Molten Street in London; seeing the images on the wall and remembering what I had to overcome to take them puts it all into perspective. LUMAS offers museum-quality art editions in over 40 galleries around the world, with more than 3000 works by 250 artists available as hand-signed originals.